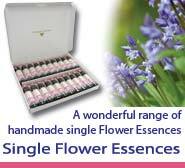 We offer a wonderful selection of single Flower Essences, from Agapanthus to Zinnia. This extensive collection makes a wonderful resource for anyone who enjoys using Flower Essences - either for themselves or as part of a professional practice. These Essences can be used singly or mixed to create your own unique combinations. Flower Essences can be very deep acting and have the ability to clear old energy patterns, thoughts & emotions, helping restore balance and harmony to mind and emotion. Each Flower Essence holds a particular vibrational frequency or energy, which helps to release old patterns, getting you to the root of an issue. Opens the crown chakra and encourages forgiveness of others. Encourages greater attunement with the innate purity of the soul, helping to encourage self forgiveness. Creates a bridge linking the ancient spiritual energy of India and the Himalayas, to cosmic consciousness. Strengthens the links between the emotional and mental body. Provides emotional support during conception, pregnancy and birthing. Helpful for both women & men. Opens the heart chakra encouraging the expression of unconditional love. Promotes a greater emotional understanding related to difficulties having children. Encourages hope and inspiration. Strengthens the meridians. A particularly useful essence for acupuncturists. Encourages the development of wisdom, helping one to see the grander scheme of things.